"LET US DO LITTLE THINGS WELL TODAY"
exposed to new ones. It was lovely to see some past pupils amongst the groups such as Amisha, Katie and Bobbie who showed great enthusiasm as they ran the sessions - a morning well spent! On Wednesday, Year 6 went to the Natural History Museum to consolidate their learning about Charles Darwin, the Galapagos Islands and the Theory of Evolution. They took part in two workshops; one centred around natural selection and evolution and the other where the children took on the role of scientists. They were encouraged to investigate and ask questions about a specimen of their choice - there are in fact 83 million specimens to be found at this museum! The children also had an opportunity to visit the Volcano and Earthquake Zone where they experienced first hand, through a simulator, how it would feel to be in the epicentre of one! Animation Nation Workshop - please scroll down to watch our completed masterpieces and photographs of the day! Please be advised that the films are directly linked to YouTube. Last Wednesday, the 16th January, we once again welcomed Barry Skillin from Animaton Nation to lead us through the process of making our own stop-animation movies. As well as making amazing animated films, this workshop helped us to develop our communication & organisational skills and gave us opportunities for problem solving, teamwork and building our self-confidence. There were also many links to different areas of the curriculum including Art, Literacy, Computing, Music, Media, Maths & Drama; certainly a day to feel very proud of all we achieved! Dissecting Pigs' Hearts - Investigating the core of our circulatory system, and our body as a whole. Bread was very important to the Ancient Egyptians as it still is now around the world. They didn't use wheat as we know it but an ancient ancestor called Emmer. They also had yeast but again not as we know yeast today:instead a wild yeast. The earliest version of this recipe was found on the wall of Senet’s tomb in Luxor, Egypt. The original recipe called for bakers to “crush the grain with sticks, using a grindstone crush the grain still finer until you have a heap of white flour ”. We skipped this part and went for the ready made flour! Year 6 have recently made two visits to the Friendship Club which meets at St Teresa's Parish Hall every other Tuesday. They were made very welcome by everyone and enjoyed chatting and sharing stories. Both afternoons had a particular focus; the first involved a very informative presentation about Mrs Kilcline's recent pilgrimages to Lourdes, Knock and Cyprus whist the second involved poetry recitals and readings. All the children were a real credit to the school, being kind and courteous at all times. Many thanks to all the members of Friendship Club for sharing their time with us as well as their wonderful refreshments and to Father Tom, Mark Hockley and Steph Kilcline for all their help in making the afternoons run so smoothly! Year 6 enjoying our recent Advent Fayre! Using an orange, salt, bicarbonate of soda, cloves and bandages we attempted to replicate the Ancient Egyptian process of mummification! The resultant 'mummies' are now drying out on the radiator in our classroom accompanied by a wonderful aroma! We are looking forward to the eventual unwrapping ceremony! During P.E we played a game to help us learn about the the function of the heart and the process of blood circulation around the body. We know that every part of our body needs blood in order to keep working. We thought about how the heart pumps blood around our body, like a milkman delivering bottles to everyone’s house. When blood leaves the heart it is full of oxygen. When it comes back from our finger, our brain or our stomach, the oxygen has been used up (a bit like a milkman collecting empty bottles and taking them back to the dairy) and so needs to visit the lungs to pick up more oxygen This game helped us to realise that, during a single cycle, blood goes twice into the heart -this is known as double circulation. We learnt that the social structure of ancient Egypt can be sorted into a social pyramid. At the top of this social pyramid was the pharaoh with the government officials, nobles and priests below him/her. The third tier consisted of the scribes and soldiers with the middle class in the fourth level. Peasants were the fifth tier of society with slaves making up the lowest social class. We carried out an activity to match the social hierarchy jobs with definitions and then to sort them into correct positions within the pyramid. Mrs Emerson's maths group have been exploring algebra and have had fun putting their understanding of algebraic terms to the test by playing algebraic top trumps! On Wednesday the 7th November, Father Tom kindly came into Year 6 where he was put in the 'Hot seat'. The children had worked hard in the morning preparing questions for Father about his life and work as a Priest and to discover the qualities needed carry out God's work. The children were full of admiration for all he does and were most certainly enlightened as to the expectations of a Priest in today's society. One of the things that particularly struck the children was how Father explained that he considers any problems/challenges that he comes across in his line of work as opportunities rather than something negative: one must never lose sight of hope and to always think of how to move forward. This was certainly an important message for the children to take away. Some glimpses of practical maths/partner work in action - drawing and labelling different types of angles to help us remember where corresponding/alternate and complimentary angles could be found within a set of bisected parallel lines - the younger children were curious to find out what was going on! We also measured parts of our bodies and then converted our results into different units. During one of our maths session we played 'Civilisation Top Trumps' - whilst learning facts about the different types of civilisations that went before, at the same time and after the Egyptians. We had fun challenging ourselves to think of different ways of sorting/categorising these cards. We thought about the link between negative numbers and AD and BC. We had to think of some rules before we started e.g. was the category 'unknown' regarded as high or low? Photos of our two off-curriculum days centred on Remembrance Day which were held on the 30th and 31st of October. The school took part in workshops and a variety of class-based activities. Please see Latest News for more examples of children's work, our 'museum' and photos of our beautiful Remembrance Mass. Yesterday Year 6 went to BT Adastral Park, Martlesham to attend a Coding Workshop along with a number of other schools. We had great fun learning to program Crumble Robots, working in teams of two or three. The day culminated in a robot race with one of our teams coming a respectable 3rd! It was a fantastic opportunity for the children to extend their coding knowledge in an exciting and innovative way. Many thanks to our parent volunteers whose support was very much appreciated. Day 5 - Great excitement but also some sadness as today we were going to be finally leaving Patteson Lodge. Not only would we have to say goodbye to all our leaders but also to Anne and Helen who had provided such wonderful meals and taken such good care of us! Surprisingly, the folding and sorting of bedclothes into piles seemed to happen without too much stress involved and then it was into the hall for our last breakfast which was once again 'the full English'! After that it was onto the coach and off to Cromer for our last morning of activities. This time it was having a look at the geological makeup of the cliffs and Skippy gave a very visual representation of how the big rocks of granite from Norway ended up on the beaches of Norfolk. We then had time investigating the creatures living in the rock pools and learnt about the giant mammoths who roamed the area during the time when the sea and beach did not exist - instead there were jungles with crocodile and hyenas all living together. The children were amazed to discover that one such mammoth came to an untimely end and that only recently was its skeleton discovered on the very beach that we were on. Lunch followed with a most glorious view of West Runton Beach - the weather couldn't have been more perfect! Then with one final goodbye to Skippy and Hoglet we were off back to Colchester - memories of the week imprinted on our minds forever! Each and every child has been a delight to be with - a week of fun and laughter. Thank you to you all. Over and out -The Aylmerton Year 6 Team. Day 4 -The big day finally arrived - the day that Joshua turned 11! We hoped that he would have a birthday to remember and I'm sure that he did! Once again we woke to beautiful sunshine. Our adventures today started with a trip to Happisburgh where sadly people are in fact not very happy. 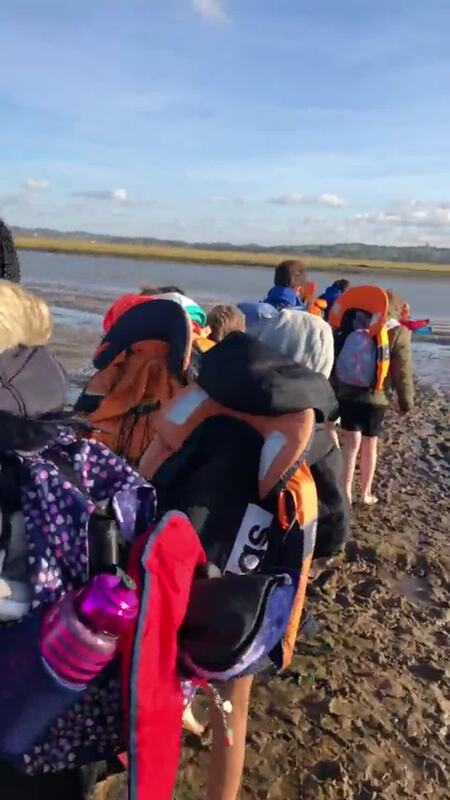 The children discovered first hand how our coastal environment is being affected by erosion from the relentless force of the sea with the people of this village sadly losing their homes at an alarming rate. It was a powerful message which I'm sure that your children will be keen to share with you. Then it was off to Sea Palling which is also in danger of destruction. However, in order to save the Norfolk Broads that lie behind from being flooded by the sea, the Government has invested a lot of money in large defenses. It was here on their beautiful beach that we had lunch, made sandcastles and had that ice-cream! 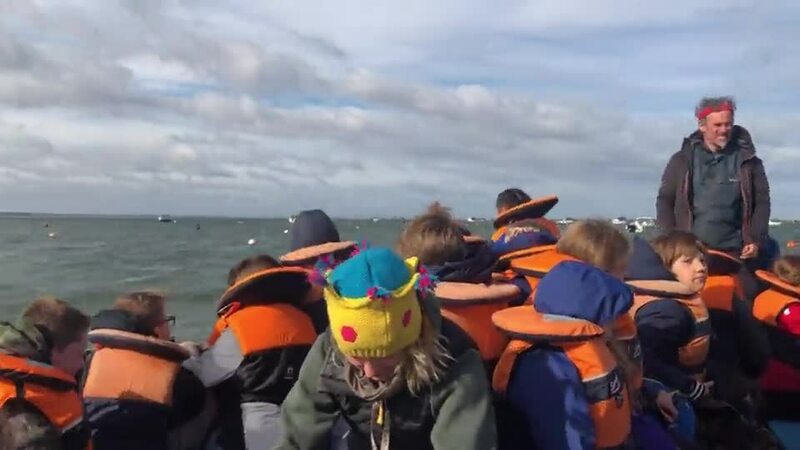 An afternoon of 'messing about on the river' followed where all the children had a chance to be captain of their boats and attempt to navigate the Norfolk Broads; I'm pleased to report that this mission was successfully accomplished! After a delicious roast dinner it was time to get ready for the disco! The remnants of powder puffs, lipstick and lynx littered the bedroom floors - it was time for the action to begin! Amongst much merry - making and fun the children danced the night away with the chance to win an elaborate balloon model always high on the agenda! The children were a delight and even the DJ commented on what a great bunch they were! Now all sleeping soundly in their beds (we wish!) Please enjoy the three slide shows below. Bowling photos have now been uploaded - please scroll down to find them under the Monster Trail photos. DAY 3 - see below for photos of Team Building Activities and the Monster Trail - Bowling Photos to follow!!! 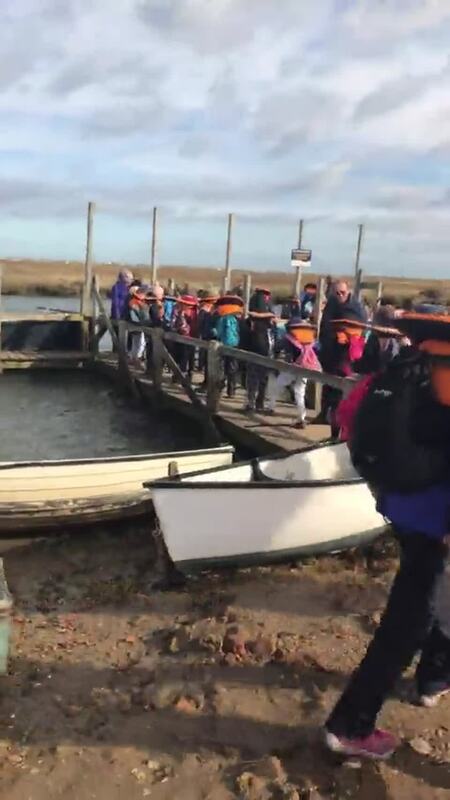 All children slept brilliantly - obviously exhausted after their mammoth walk across Blakeney! Once again it was a beautiful day which greeted us: perfect for our Team Building Activities. The children were given a talk about how to work as a team; endurance, resilience, co-operation and listening to each other is all crucial. It was a delight to see the real sense of achievement on their faces when they realised that they had finally completed their task! The icing on the cake was Tyler finding a four leaf clover - apparently a 1 in 10,000 chance! ....and then it was onto Bacton Wood for the Monster Trail - what follows is not for the faint -hearted! The children, using their orienteering skills, had to find their way out of the woods but unbeknown to them, there were monsters lurking ready to pounce...and pounce they did! Happily, all 32 children were found to alive and well by the time we returned to the coach! Day 2 - I think these photos say it all - from the moment we left Patteson Lodge this morning until our return about 7pm this evening we did not stop! The fact that it was such a beautiful day just added to the magic! 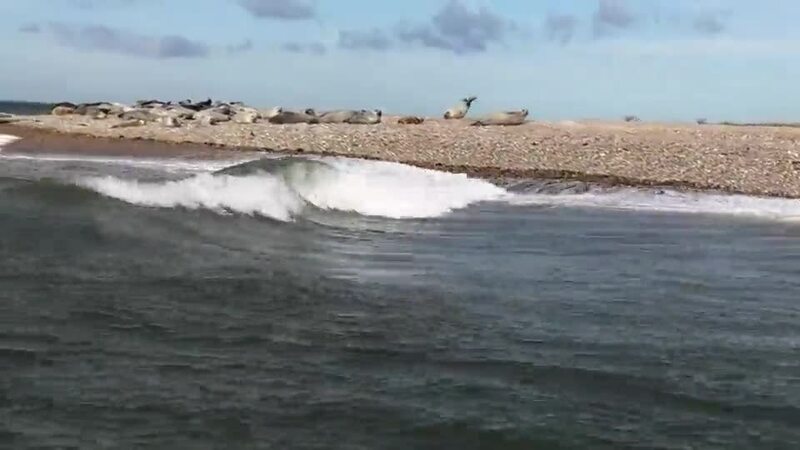 First it was off to Morston to catch a ferry to go Seal Watching. The children were all captivated with the antics of these beautiful creatures as well as by the impromptu pirate songs sung by our very own Skippy! 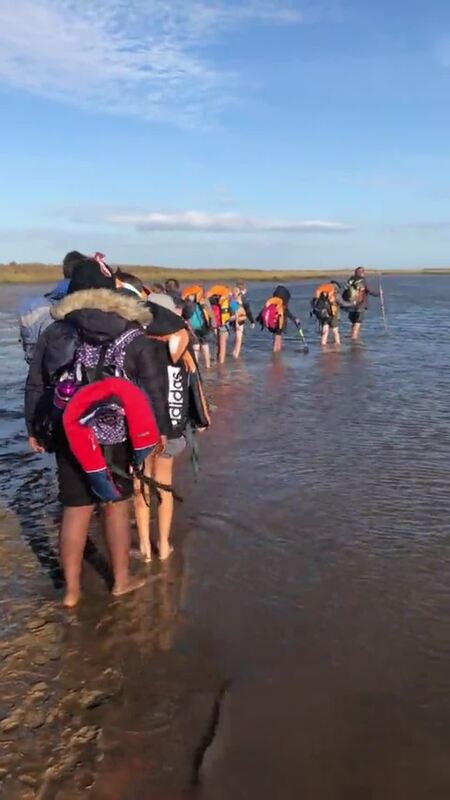 After this it was off to investigate the unique habitat of Blakeney Point itself and to visit the Watch House which once housed the life boats but now no longer thanks to the might of the sea. We chilled out in the dunes, ate lunch at the 'cafe' (ask the children), hunted for gems on the beach and finally completed our 'once in a life-time mud walk'. 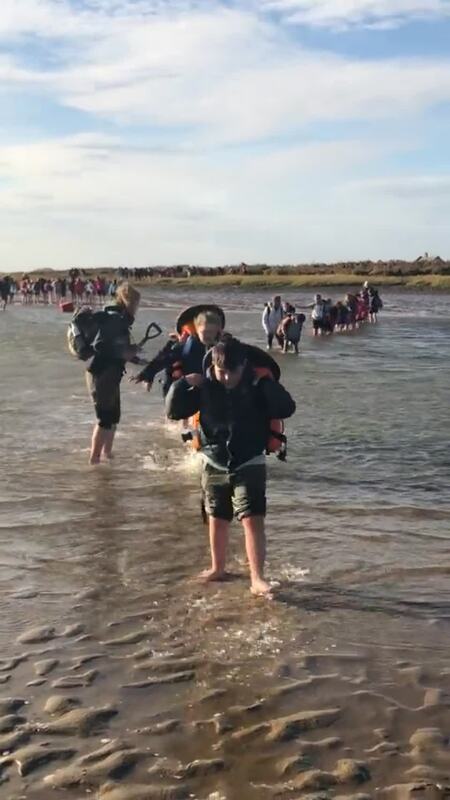 The children were all brilliant - they took everything in their stride and even those who ended up muddier than others did not complain! A dinner of bolognese and pasta was waiting for us upon our return and then it was definitely time for a shower! 'Movie Night' followed with a showing of Gnomeo and Juliette and then it was off to bed...and hopefully a peaceful night for all. After an eventful start to our day we finally arrived to a big welcome from Eagle Eye and the Aylmerton Team. There was great excitement as the children were shown their rooms and best of all were finally able to eat lunch! A wonderful afternoon followed of den building and woodland games designed to test our senses. Then after a delicious dinner it was off out again for our night time walk to look for bats and to visit a derelict Saxon church; the perfect setting for the telling of a ghost story! Finally it was back to the lodge for a camp-fire and then hot chocolate and cake! All now safely tucked up in bed with most already being fast asleep! During a recent science session we set up an investigation to try and prove that light does indeed travel in straight lines! Using Ancient Egyptian motifs as inspiration, Year 6 composed and then performed instrumental interpretations of their chosen pictures. British Values Day - Year 6 learnt about the democratic process of electing a new government. In groups they were challenged to put together an idea for a new bill to be presented to Parliament and to write a speech to support their idea. A vote was then taken as to which bill would be put forward. They also had an egg and spoon race with no rules - not surprisingly, chaos followed. The children shared their thoughts as to what the world may be like if there were no rules!